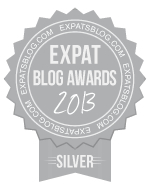 Very proud moment hearing that I won the Silver award for best expat blog in England! WOW, I am so thrilled!! Eeeeek! Never won an award before and I tell you, it’s fabulous. Really pleased and so thankful to everyone who commented on my blog entry. I really really appreciate it and would not have won any award without your amazing comments. THANK YOU. Congratulations to the Gold and Bronze winners. Really pleased for all of us. Great job expat ladies in the UK! Gold winner Jess of The Fly Away American and Bronze winner Muriel of A blog of a self proclaimed Yummy Mummy living in London Fantastic! And to Jess and Muriel, if you ever want to guest blog on Bringing Up Brits, please just let me know, I’d love to have you! And don’t forget to check out my Pinterest boards. I’ve got one for Books for Expats, Websites for Expats, For Expats and living life abroad, plus my new Christmas board! Hope to connect with more of you soon! Thanks again guys! I am just glowing! And Merry Christmas.